Manila, Philippines - In the severe weather bulletin issued as of 11a.m. today, January 31, 2014, weather bureau PAGASA announced that Bagyong 'Basyang' with International name of 'Kajiki' has intensified into a tropical storm as it continues to move towards Leyte - Caraga area. Public storm warning signal no. 2 is now up in some areas of Visayas and Mindanao. At 10:00 a.m. today, the center of Typhoon “BASYANG” was estimated based on all available data at 500 km East Northeast of Hinatuan, Surigao del Sur (10.4°N, 130.4°E). Typhoon 'Basyang' has a maximum sustained winds of 65 kph near the center and gustiness of up to 80 kph. It is forecast to move westward at 30 kph. Bagyong “BASYANG” is expected to be in the vicinity of Naga City, Cebu by tomorrow morning and at 133 km Northwest of Puerto Princesa City by Sunday morning. By Monday morning, it is expected to be at 729 km West Northwest of Puerto Princesa City or outside the Philippine Area of Responsibility (PAR). 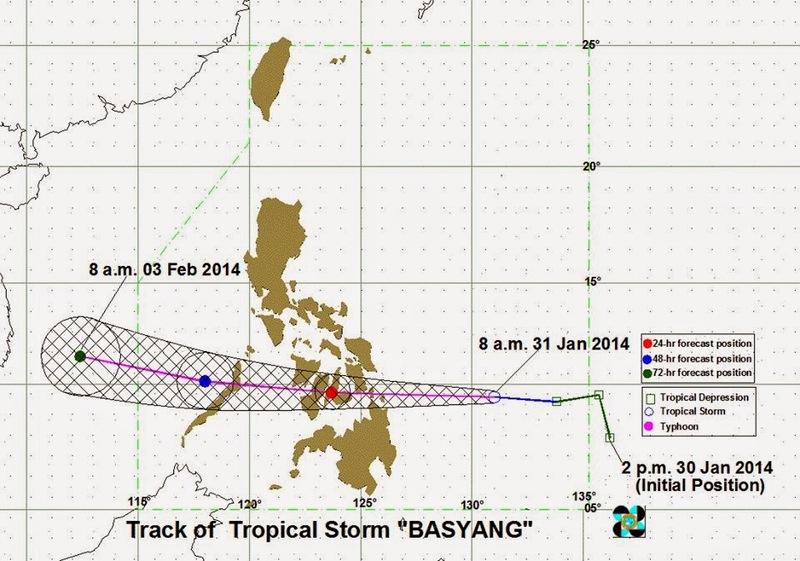 PAGASA expects 'Typhoon Basyang' to make landfall over Surigao Provinces late tonight or early tomorrow morning. Residents living in low lying and mountainous areas under public storm warning signal #1 are alerted against possible flashfloods and landslides. Estimated rainfall amount is from 5 -15 mm per hour (moderate - heavy) within the 400 km diameter of the Tropical Storm. Fishing boats and other small seacrafts are advised not to venture out into the eastern seaboards of Central and Southern Luzon due to Tropical Storm “Basyang” and the Northeast Monsoon.